Wow – I don’t know how its possible that I have no posts all summer! Rob and I were lucky enough to travel to Iceland and I have taken several smaller trips and adventures around the beautiful southwest. As summer has closed, the last of the produce filters through my garden and the market. This time of year I like to fire up the grill a few more times and savor the last juicy ripe tomatoes for the year. I also like to spend as much time outside enjoying my favorite season and am not quite ready for long cozy days in the kitchen so quick meals are on the agenda especially as the days get shorter. This is a winner that we had the other Saturday after a morning exploring the changing aspens, and preparing for the first Fall Retreat. I am still reflecting on the magic filled moments of the Retreat – it was full of friends new and old and infused my life in joy. Please note with a little planning you can easily make the polenta from scratch, and put it in a pan or dish to solidify overnight (and it will of course taste better), but the pre-made tubes are quick, easy, and convenient, and were just the ticket as we were planning the week ahead. Bonus: they make great easy car camping fare ( your fellow campers will be impressed with the gourmet meal). 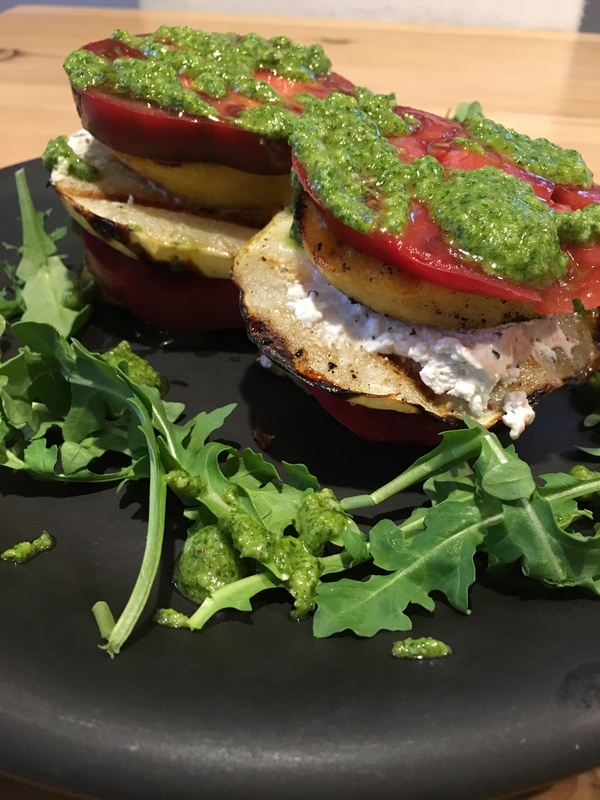 Topped with a generous amount of peppery arugula pesto these stacks are a wonderful last taste of summer. This recipe is ripe for creative interpretation – add eggplant or roasted red pepper you name it. So this weekend grab the last of the veggies from the garden and stack it all up 1 more time! 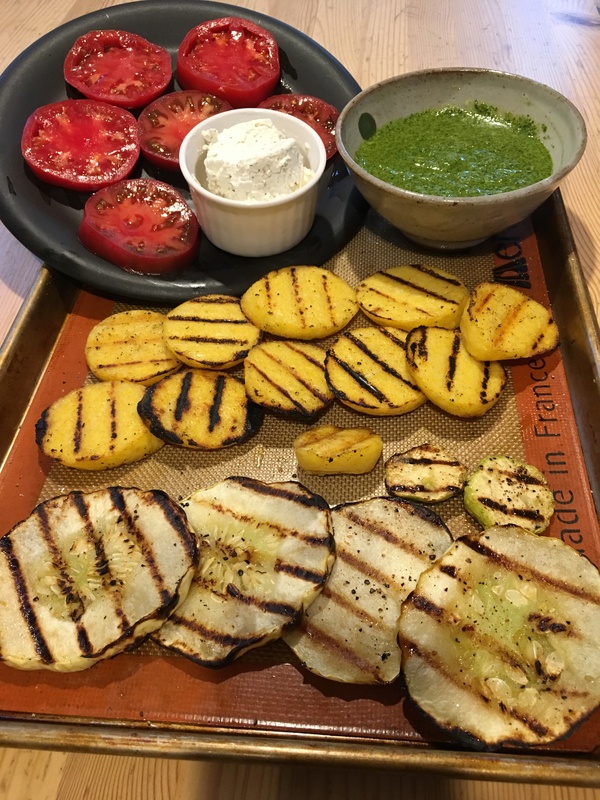 Top with generous amount of pesto – Enjoy!